This library requires that your board has a matching firmware installed. When the library is updated, also the firmware might be updated, but it is not mandatory. 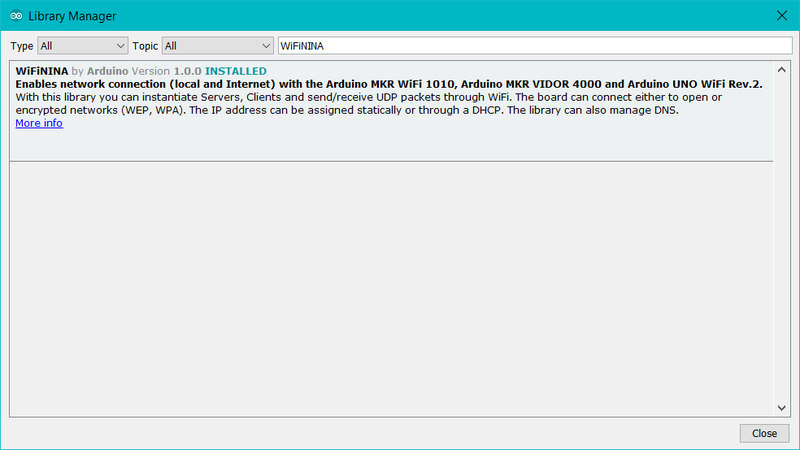 To avoid any issue and ensure that you have the most up to date setup, we suggest that you check your WiFiNINA library with the Arduino Software (IDE) Library Manager. There is an option in the Preferences that enables the check for updates of any of the installed libraries at startup. If you haven't installed the WiFiNINA library yet, you won't get notified about its updates. Anyway, you get the library status just writing its name in the search field on top of the Library Manager. When the library version installed on your computer is the latest available, you may check the firmware version of the board or the shield. We have prepared a utility sketch to check the firmware version and its matching with the library. If the firmware needs an update, another utility sketch enables the process. Below the link to the relevant tutorials. You find these two utilities under Examples - > WiFiNINA -> Tools. CheckWiFiNINAFirmwareVersion : Reads the required firmware number required from library and matches with the one installed on the board or the shield. WiFiNINAFirmwareUpdater : The sketch that must be loaded to allow the firmware and certificates update process through the integrated plugin of Arduino Software (IDE) rel. 1.8.5 or later. The WiFi class initializes the ethernet library and network settings. The UDP class enables UDP message to be sent and received.